This installment of the Otyughnomicon-series from Purple Duck Gamesis 8 pages long, 1 page of which is devoted to tokens of bears and the Otyugh-variant, leaving 7 pages of content. 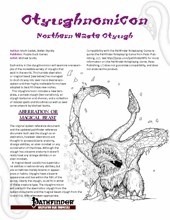 After a short introduction discussing teh magical beast/aberration-controversy surrounding the otyugh, we are introduced to the new Northern Waste-template (CR +1), which adds some survival-abilities as well as icy touch and the ability to create mini-blizzards. 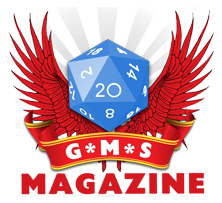 I liked the template and, following the example of the first pdf, we get two versions of northern waste otyughs, one based on GOW and one on PFRPG-core, both of which clock in at CR 5. 6 new spells appropriate for the oytughs are presented and they are quite cool, providing deadly options to create ambushes and become truly lethal predators of the icy north. For the rather…grimy, a new and aptly-written sorcerer bloodline for the otyugh is provided along 5 deadly pestilence-centered bloodline spells. Editing and formatting are top-notch, I didn’t notice any glitches. Layout adheres to the 2-column standard and is rather printer-friendly. The artworks are neat for the low price and the new template is ok. The sample tribe was nice and the spells are mostly cool and come with information for APG-spell-lists, which is nice. The pdf comes with extensive bookmarks and the sorceror bloodline is among the finest I’ve seen in quite a while. When all’s said and done, I did prefer this installment to the first one and consider it a bit superior, but I think it still has some room for improvement – some truly ingenious signature abilities would be nice. Thus, my final verdict will be 4 stars – a good buy for the very fair price.